This mask is for the chemically sensitive user who might react to Neoprene or other materials used in pollution masks. 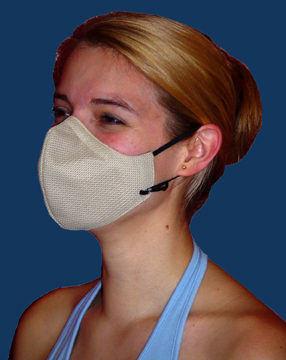 After the developer was diagnosed with a chronic lung disorder that made her more sensitive to odors and fumes, she designed this featherweight, comfortable and effective mask. 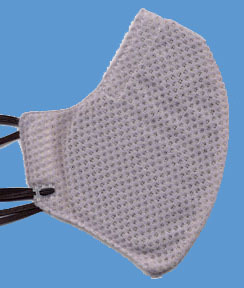 The porous honeycomb I Can Breathe mask holds an activated coconut-shell carbon filter with two polyester linings that filter odors, fumes and fine particles, reducing exposure from 78% to 100%, depending on the substance. Reduces exposure to air pollution, soot, smoke, gasoline fumes, fragrance, mold spores, chemical smells and more (Click here for a list). Effective for indoor as well as outdoor pollution. One size fits all using elastic ear loops. Shell made of nylon/polyester/cotton blend. 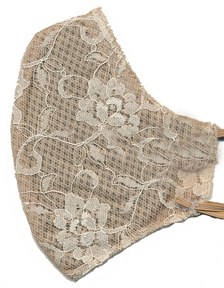 Choose from beige (pictured above), ivory lace (over a beige mask), or silver-grey. Filter lasts 20–40 hours. Replacement filters can be purchased in two-packs or 5-packs. Please note that I Can Breathe filters are not returnable once opened.